Just because you don’t have the space for a walk-in closet doesn’t mean you can’t have outstanding clothing storage. These days you have many amazing options for closet systems that are implemented in the reach-in closet. Where can you get a closet system? Can you build closet organizers yourself? How much do reach-in closet organizers cost? What are the typical reach-in closet dimensions? It’s a traditional closet usually concealed behind sliding doors, curtain, full swing doors or folding doors. While old-school reach-in closets were pretty simple consisting of only a bar on which to hang clothes, these days closet systems can efficiently store your entire wardrobe. In fact, if you’re able to run reach-in closets the full length of a wall or along two walls, you can end up with as much storage as a walk-in closet. Together these various storage elements make up a comprehensive storage solution inside of a closet. While some can be fairly expensive, it’s often less expensive than a full renovation to build a walk-in closet. Besides, not all homes have the space for adding a walk-in closet and so the best option to improve a home’s clothing storage is to invest in a closet system in the existing closet. Below is our extensive gallery featuring many amazing reach-in closets that have custom closet systems. What is it about the color white that makes everything look airy and spacious? This lovely eggshell white closet organizer is done in shades of dove white with accents of pale baby blue. The white closet space complements the white marble table and fresh carnations outside. The closet space also has a window and a big white fixture so that you can choose your outfit for the day without any hassle. This handsome and modern closet organizer is very masculine, with its straight, bold lines and pale neutral-toned woodwork. Everything, from the immaculate suit jackets to the travel duffel bags are organized exactly in place. This closet style is perfect for a bachelor who prioritizes organization over flashiness. This reach-in closet stands in perfect harmony with the bedroom it is installed in. The closet has soft white lines which provides a very pleasing and balancing effect to the bedroom, which has a bold teal-gray accent wall and a large mirror with an ornate and gilded frame. The closet’s pale teal tinted sliding doors are a lovely match with the wall. This closet has lots of character and personality. Cool and casual, this reach-in closet is the perfect accompaniment to a beach house bedroom. The closet has white doors and trims. It comes with a grey-brown set of drawers that mimic the look of beach sand. The room reflects ocean colors like aquamarine and turquoise and the hanging sunhats and loose blouses give the perception the beach is just outside. This super pretty floral bedroom is every young girl’s fantasy — and so is the accompanying closet. The bedroom is painted in beautiful dusty rose pink with a bed with a flower-printed sheet and a floral painting hanging above it. The pale cream color closet matches the color of the lower wall and perfectly showcases all the frills and frippery that a girl could ever want. This cute little white closet is filled with all the tiny little clothes that a baby boy needs. The small but perfectly sized closet is in reaching distance to the crib. It has no doors so that all the adorable little necessities inside are always perfectly accessible at the right time. We can’t guess whether this little closet belongs to a tiny boy or girl, just based on the cute little clothes in lovely pastel colors arranged inside it or the sunny yellow walls. But what we can say is that the closet is a treasure trove of plush toys for the room’s little occupant. This wonderful built-in closet is perfect for a woman who loves to work but has her share of traveling and adventure too. The closet is trimmed in eggshell-white with the back of the closet in a solid dove gray color. Although it is free from frippery, it has plenty of shelves to accommodate everything a woman wants. With bold gray paint, sharp lines and a light gray drape, this closet is a perfect representation of a rugged and outdoorsy man. Much of the attire consists of bush shirts, jeans and sturdy boots, and the closet reflects the room which shows a taste for adventure and travel. The air of elegance and chicness makes this the perfect closet for the modern woman. The closet has silver-colored trims with graceful sliding doors. The inside is carved with dark wood that nicely balances the cool tones of the white door and walls. The closet perfectly complements the living room with its warm and cool shades. This open concept closet is located in a room with dark gold walls and several antique and ethnic objects, all with gold accents. The creamy white closet balances the warm tones and elaborate patterns of the room and reflects the beautifully contrasting characteristics of the objects inside, including modern high heels and gold-tasseled throw pillows. This white and gray closet has many elements that indicate a countryside living. The shoes are sturdy and there are several woven wicker baskets. The in-built chest of drawers is also made of dark oak-like wood and gives a cozy and inviting aura to the pastel blue-and-white room. This is a sturdy, no-frills and masculine closet perfect for a business executive. The straight and sharp steel and glass door of the closet, coupled with the white woodwork, are designed to immaculately organize and display the contents in the most efficient way. The great thing about this closet is that it has wonderful doors with blue and white streaks, which give the impression that they are made of icicles. The white closet inside has plenty of shelves for hanging clothes and accessories and a nice space above to store boxes. The golden brown wood of the floor counterbalances the icy tones of the closet organizer. This lovely room is decorated in shades of pastel gray, pink and teal, but the highlight of the room is the open concept closet, immaculately organized with feminine goodies. The creamy white tones of the closet are offset by the warm rich color of the flooring and the golden lamps hanging from above. This is a perfect dressing space for a young lady of fashion. This beautiful closet is super modern and exudes plenty of elegance. The reach-in cabinet features long, crystal clear glass sliding doors, shelves and drawers made of pale white wood, which make it look like you are viewing the clothes and accessories from outside an elite clothing boutique. The overall interior and decoration of the closet perfectly matches the bedroom. If you think your other half loves to hoard space in the closet, this wonderful twin closet is the perfect solution. The white closet is divided into two equal parts so both you and your loved ones can have plenty of space to organize the things they care about. f you want an elegant and no-fuss gender-neutral closet, let this be your inspiration. The open concept closet’s cabinets, shelves, walls and drapes are present in lovely contrasting shades of gray that match the bedroom floor. This closet is very modern and elegant looking. This reach-in closet is utilitarian and functional but also stylish as well. The closet is done in white with accents of sky blue, but its floor is made of dark wood that provides a warm contrast. You can also get a hint of the eclectic from the clear-plastic chair and the odds and ends stuffed on the shelf. What is so great about this closet is that it doesn’t need much space at all. This golden wood closet slides inside and disappears from view when you don’t need it. The glossy golden wood of the closet gives a rustic and inviting touch to the room. Here is another innovative closet that don’t require much room at all. In fact, they remain hidden from sight underneath a staircase unless you pull them out. The doors of the closets are painted a brilliant white while the interior is made of warm rose-brown wood. These closets are both efficient and stylish. This is the perfect closet for an attic with hip roofs. This free-form closet has made the most of the small space in such a way that there is plenty of space in its drawers and shelves. What’s more, it is located next to a small skylight that lets in plenty of natural light and makes the room seem bigger. Another great way to maximize the available space is to move in the closet within an alcove in your room. This tall, slender closet has found the perfect niche for itself within the walls and now offers a lot of room to organize clothes, shoes, bags and other stuff. The pale wood also lends a touch of elegance to the room. This beautiful closet catches the eye immediately because of its vivid and bright peacock blue exterior. The interior is comprised of horizontal shelves so that you can line your clothes, hats, bag and boxes with plenty of space to spare. The closet has louvered white sliding doors and the entire look is very artsy. A blend of contemporary and traditional style, this closet has folding doors that turns in on itself. The closet is white and no-fuss and it is evident that the cute blouses, little booties and knick and knacks should be the focus of this closet. A perfect clothing storage space for a working man, this open plan closet has straight practical lines, plenty of shelves to organize clothes and even some left over for sentimental items. The deep sleek silver tones of the closet perfectly represent an industrial, high-tech, sophisticated and modern man. This very urban and modern closet exudes an air of mystery. The glass sliding doors are smoky and translucent and open to reveal an interior made of golden wood. Several spotlights in the closet give the wood a warm glow. Several antique-looking objects and an Indiana Jones-style hat give the illusion of the owner being a man of adventure and mystery. This beautiful wide and classy closet has no shortage of space. The doors are designed in the classic Shaker style with recessed centers, which look very pleasing to the eye. The center of the closet organizer has four pull-out drawers and three shelve spaces of the same size. The best thing about this closet is the perfect symmetry, which makes the closet look balanced and graceful. This multi-tiered reach-in closet looks so cool, it seems a shame anyone would want to close its sliding doors. Although the shelves are classic white, the drawers are made of dark wood, giving it a contrasting and dramatic finish. The result is a modern yet timeless look. Simplicity is much understated; however, as this closet organizer shows, it can be a thing of beauty. This clear-cut, streamlined and straight forward white closet is the perfect solution for all your clothing and accessory storage needs. The closet offers multiple flat tiered shelves for smaller objects as well as longer space for hanging shirts and dresses. The closet is down-to-earth, yet very attractive. Deep dark solid colors always exude sophistication and classiness. These modern closets consist of minimal design; the doors are made of dark brown, almost black, wood, while the interior is snowy white and provides a dramatic contrast. The inside of the closet is multi-tiered so it can store plenty of things of all shapes and sizes. The dark exterior also provides a theatrical look against the bright wide backdrop of the walls. See all closet designs here. You have many options, including buying them pre-built here or here or here or hiring a custom cabinetry shop to design and/or build one for you. In fact, storage and closet design is such a big industry these days that there are interior designers that focus on closet systems and designs. Lisa Adams is one such designer. Closet Factory and Easy Closets are two companies that offer custom closet systems as well. Of course. DIY is huge these days and many people design and build their own closet systems. You can save significant money doing it yourself. Moreover, you can get all you need at today’s mega home improvement stores such as Home Depot, Lowe’s and others. Here are few profiled online to get you inspired. Ana White: Ana White profiles a DIY closet system costing less than $250. Click here to check it out. Bob Vila: Bob Vila showcases 5 different designs you can build. Click here. Familyhandyman.com: This is a comprehensive DIY closet system project you can check out. Click here. Before getting started with your DIY closet organizer project, read this great article offering tips of what NOT to do. While closets are usually restricted to bedrooms, these days with such a big need for storage, closets are actually built into many rooms of the home. With a nice closet system installed, they can look fabulous and offer plenty of storage. same concept and purpose as living room. Frankly, a home office is an ideal space for a well designed closet system. I have a closet system (circa 1983) in my home office and couldn’t imagine not having it. Of course a laundry room could benefit from a closet system. Any entry way can have a closet which includes a closet system. DIY: $100 to $500. The DIY option is key if you’re looking to save money. The cost will depend on the quality of materials you buy. This assumes you have the tools. Pre-made: $100 to $1,000. The low end is not a lot of storage… often a single shelving unit, or else it’s very low cost such as the wire type of shelving. If you’re looking for a full scale, decent organizer, expect to pay upwards of $700 to $1,000. For example, IKEA’S PAX closet system is insanely popular and costs $890 (at time this post was published).IKEA, Wayfair, Amazon, Home Depot and many other “home improvement” stores offer all kinds of pre-built closet organizers. Just be sure you know your closet dimensions when buying a pre-built organizer. What’s cool about IKEA closet organizers is that you can buy the individual pieces a la carte so that you can get a great closet system regardless the size of your existing closet space. Check out the various components and pieces you can buy at IKEA. Custom: $1,500 to $5,000. Now you’re talking some bucks. You’re paying for design, materials and installation. However, you get exactly what you want without breaking a sweat. The only standard reach-in closet dimension is depth, which is 24 inches (2 feet). Width will vary, but you want at least 48 inches (4 feet) in width per person. Therefore a kids room would be fine with a single 4 foot wide closet; however, a master bedroom should have an 8 foot wide closet (at a minimum). 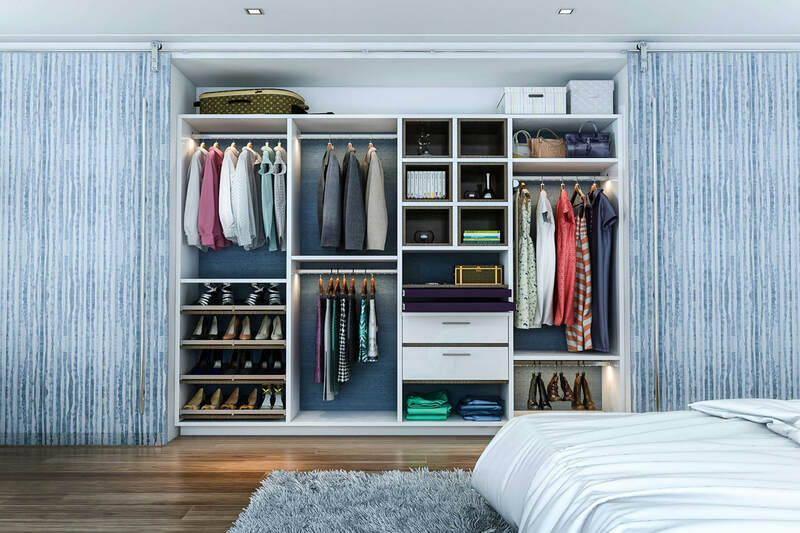 A terrific resource for many standard closet dimensions is the Architectural Student blog which sets out standard depth, width dimensions along with suggested spacing and rod heights for your various closet system items. This is a must-read article if you’re designing your own closet system. Easy Closets design software: I like this software because you don’t have download anything, you can input custom dimensions and then it creates a suggested design which you can customize from there. Super easy to use. Designs reach-in, walk-in and custom closets. As you design the closet, the price is presented so you know how much each element you implement will cost you. Easy Track Software: Designs reach-in and walk-in closets. Just like Easy Closets software, it comes up with a suggested design based on the dimensions you provide. From there you can customize the design. As you design the closet, there’s a price displayed so you know how much it’ll cost. Organized Living: This is a robust closet design software option for reach-in and walk-in closet design. You can choose from simple to premium designs as well as choose your materials. It’s pretty cool. ClosetMaid: This offers some nice choices including inexpensive suggested wire organization or the more expensive options. It generates several suggested designs that you can customize. Closet Organizers USA: Offers plenty of customization options. All software is online (nothing to download). Home Depot Closet Design Software: Decent, online closet design software option. Great if you want to buy from Home Depot since the designs will be those for which Home Depot can provide the materials. elfa design center (The Container Store): Online closet design software that offers some decent design solutions. IKEA Pax Wardroom Planning Software: You can customize your IKEA Pax wardrobe design. While the above software is free to use, obviously buying the materials and/or installation of the suggested designs will cost you money. Sliding doors: Arguably the best door option for reach-in closets because it requires no empty space around the closet. Bifold doors: Folding doors are space-saving doors for sure and they were widely used for closets in the 1960’s through 1990’s, but they’re no longer the most popular having been taken over by sliding doors. Curtain: This can be an inexpensive option, but I don’t really care for the look. I prefer no doors over curatins. Single traditional swinging door: This is probably the worst option since it requires so much empty space surrounding the closet just for the door to open. Avoid this. French doors: If you have plenty of space, while this isn’t space-efficient, it can look fabulous. No door: Actually, because a well designed closet system can look pretty cool, I think leaving it open is a viable option. Barn-style sliding doors: I think the sliding barn door is a design fad that will go away, but for now they’re popular especially in rustic spaces. What’s the best door type for a reach-in closet? These days, sliding doors are popular because they don’t require any additional space. You can have a bed closer to the closet than if you have a full size swing door which needs space to open. In fact, sliding doors require less space than folding doors too, which are old-school closet doors. The only downside with sliding doors is they tend to break down if they’re not high quality. By break down I mean they come off the rails. If you have pocket doors or sliding doors, you know what I’m talking about and getting them back on the rail is not an easy task. Actually, sliding doors reminds me of a funny story. In the Summer of 2016, my wife and I along with 2 young kids rented our first motorhome for an epic 5,000 kilometer road trip. The motorhome was pretty new. We were about 20 minutes down the road when all of a sudden the bathroom sliding door rolled backward and shot off the rail slamming into the rear of the motorhome. We couldn’t get that door back on the rail for the rest of the trip. We stored it in the sleeping area above the cab and had to move it in and out of our motorhome every time we set up camp. Goes to show you that if you opt for sliding doors, ensure they’re well made.